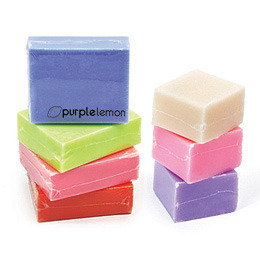 Aromatic vegetable soaps, available in a delightful range of colours and fragrances. Individually shrink wrapped and decorated with custom printed label. Available in 100g bar. Fragrances/Colours (100g): cucumber and aloe vera (light green), wild berry (dark pink), chocolate (brown), coconut and vanilla (beige), lemon sorbet (yellow/white), oriental lemongrass (green), tropical papaya (orange), peony rose (pink), passionfruit (dark yellow), raspberry (dark pink), frangipani (cream), chamomile (blue/purple), goats milk and jojoba (white).